There are several paradoxes that cast doubt on whether human language and the biology enabling it could have naturally originated through any type of process yet imagined by anthropologists, linguists, or evolutionary biologists. Under orthodox assumptions it is extremely difficult to imagine any plausible scenario that might have begun human language. We might perhaps imagine some extraordinary caveman determined to start teaching language to some of his fellow caveman. But how could such an individual ever have even had a thought such as, “I will now start teaching some words to my cavemen pals” when no language yet existed? We can imagine such a caveman inventing some nouns useful to himself and his other cave dwellers. But in order to get anything like a real language started, you need some rules of grammar. How could rules of grammar ever have been taught to anyone, before a language had appeared? You can't explain a rule of grammar to someone unless you already have a language for the explanation. In order for a language to get started to any significant extent, it would need to be established in some group larger than some tiny little tribe of 10 or 12 people. If there was any type of government or large social organization, even one consisting of as few as 100 people, then such a government or organization could force all of its members to standardize on some particular language. But it seems that no such government or social organization could ever get started in the first place unless there was already a language existing. Michael C. Corballis has argued that a hand gesture language existed before human speech. It is indeed true that a very wide variety of signals can be made with human hands. That is demonstrated by the sign language used by the deaf. But the possibility of a hand gesture language does nothing to explain the origin of spoken language. To the contrary, there is a very strong reason why such a possibility makes the origin of spoken language much harder to explain. Before any spoken language, it would have been possible for humans to communicate fairly effectively and clearly using hand gestures, in which particular words are expressed by particular hand gestures. If humans first started speaking before developing all the specialized biology needed for clear speaking, they would only have been able to speak in a very unclear and garbled manner, like a modern person trying to speak while holding his tongue against the bottom of his mouth, or trying to speak with a mouth filled with rocks. Such a primitive mode of oral communication would have been greatly inferior to hand gestures as a mode of communication. It therefore seems that oral language never could have become established before organisms developed good speech biology like modern humans have, and that there would never have been any gradual progression from primitive, garbled speaking to the type of clear speaking like humans now have. You can get a better grasp of this difficulty by imagining some time in which a hand gesture language had been established among cavemen. Now, imagine that someone tries to introduce oral language. But it wouldn't have been like someone trying to teach new words by pointing to a rock and saying, “Sog,” or pointing to the sun and saying, “Wof.” It would not have been nice, clear intelligible words like that. Instead, given the non-existence of specialized speech biology, it would have been like someone pointing to one object and saying, “Aaaaa,” where “Aaaaa” is the sound you might make trying to speak the word “rock” while holding your tongue to the bottom of your mouth. Trying to establish a spoken language under such a limitation would have been effectively impossible. People would not have switched from an effective form of communication (nice, clear, easy-to-understand hand gestures) to a very ineffective form of communication based on garbled, barely intelligible vocalizations. It seems, therefore, that there is no plausible way under orthodox assumptions to explain the natural origin of oral language and the human biology needed for its clear articulation. This is the IPS paradox. Even if you imagine some lucky individual who was blessed by some random mutation making it easier for him to speak clearly, such a person would have started out in a social group in which he was the only one with such a mutation. You can't get spoken language started with only person in the group being able to speak clearly. In the graphs below we see a visual representation of the IPS paradox. In the first graph, we see that human speech starts out being much less effective for communication than a hand-gesture language. 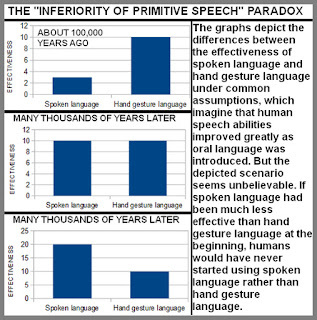 The second graph depicts a time many thousands of years later, after an anatomical progression which has caused spoken language to become as effective as a hand gesture language. 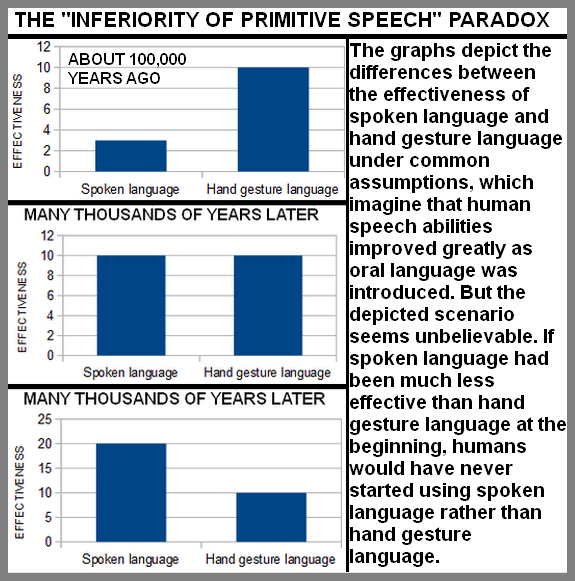 The third graph depicts a time many thousands of years later, after an anatomical progression which has caused spoken language to become more effective than a hand gesture language. The problem is that the tale told by this series of graphs is an unbelievable story. If spoken language had started out being much less effective than hand gestures, primitive humans or their ancestors would never have started using such spoken language, and would have instead kept communicating with hand gestures. The claim that a hand gesture language would have been much easier to get started than a spoken language is supported by the fact that scientists have succeeded in teaching a gorilla named Koko to communicate with hand gestures, but no one has succeeded in teaching an ape or a monkey anything like a spoken language. Let us look at some ways you might try to resolve this paradox without straying too much from Darwinian orthodoxy. One possible way out would be to deny the claim that spoken language must have been much less efficient than hand gestures as a communication tool. You might claim that when the first words were spoken perhaps 80,000 years ago, people were able to speak almost as well as we can speak today. The creation of speech requires precise control of more than one hundred muscles of the larynx, the respiratory muscles, the diaphragm, and the muscles between the ribs – our “intercostal muscles”-- and muscles of our mouth and face – our orofactal muscles. The muscle movement required of all these parts during speech is mind-bogglingly complex. And here Everett is not even mentioning specialized biology in the brain. Stroke victims often lose much of their ability to speak. So there is not only a good deal of the brain specialized to allow speech, but also a good deal of speech-specialized biology in the area around the mouth, throat and lungs. There is no natural reason why humans would have had so much speech-specialized biology when humans first started to speak. The problem with such a scenario is that the very small use of language at the beginning would be insufficient to cause all the biological specializations related to speech. If speech is the only method of communication, there might be some natural selection reason that might cause those who spoke better to survive much longer, resulting in biological specializations over generations favoring speech. But if speech were merely a minor effect completely overshadowed by hand language, then there wouldn't be any major “survival of the fittest” advantage that might be evoked to help explain the appearance of many biological specializations favoring speech. So it seems that a scenario like the one above would be insufficient to explain how human vocalization abilities could ever progress to the point that spoken language could become as effective as hand language. We should not at all reduce the origin of language problem to the mere problem of explaining the origin of a non-physical language. The broader problem includes two things: (1) the origin of a nonphysical language; (b) the origin of physical changes in human biology that made language possible. As the previous quote by Everett shows, there are many biological features below the brain that are specialized for producing language. There also is a significant part of the brain involved in interpreting or producing speech, as we can tell when a stroke causes someone to lose his ability to speak, or damages his ability to understand speech. An evolutionary biologist would attempt to explain such biological features by imagining random mutations that were blessed by natural selection. But such features would require multiple favorable mutations. One problem is that at the time such random mutations supposedly occurred, the human population was very small – supposedly no more than about 20,000. The smaller a population, the less likely that any particular set of favorable mutations will occur in it (just as the smaller the pool of poker players, the less likely it will be that at least one of them will be dealt a royal flush in spades). So we must imagine some incredibly improbable luck for all of these favorable speech-enhancing mutations to have occurred. First, they imagine there was some lucky mutation that produced some benefit. Then they imagine that this benefit caused a survival benefit, leading to more offspring for the person who had this mutation. They then suppose that the genetic trait caused by the mutation became more and more common in the gene pool, because of the increased reproduction of those who had the trait. Finally, they suppose that after this “classic sweep” was completed, the trait became established in all of the population, and the mutation is said to have achieved a fixation. This explanation does not work to explain complex biological innovations requiring multiple mutations, but it might explain some simple cases of a biological improvement. For example, we might explain an increase in fur in an animal through such a technique, if we can imagine that there was one mutation that caused an animal to have more fur, and that such a mutation caused an immediate survival benefit. But the general type of explanation given above would seem to be worthless for explaining a biological improvement in speaking ability. Let's consider an example. Imagine there are only about 20,000 humans, all but one of which lack the ability to speak clearly. Now suppose one of these humans is blessed by some extremely unlikely mutation that causes him to be able to speak more clearly. Would this result in an improved survival for this individual, with a higher likelihood of reproduction? Not at all. The reason is that successful use of language always requires at least two people. So the individual who had this lucky mutation would not see any survival benefit during his peak reproductive years. Although this individual might be better capable of speech, he would be living in some little tribe in which speech wasn't common. So he would very probably get no survival benefit at all. It is true we can imagine some highly improbable scenario in which a language-improving mutation might lead to a survival that would not have occurred otherwise. For example, if you were a caveman 80,000 years ago blessed by a language-improving mutation, you might be not able to speak to anyone until your son grew up, but your son might inherit that mutation. And perhaps your son might save your life by saying, “Look out Dad, there's a bear behind you.” But the chance of this seems very slim, about the chance that a randomly chosen person today will have saved his father's life by saying something like, “Look out Dad, there's a car coming.” We can also just as easily imagine reasons why language ability might cause someone to die early. For example, if one caveman could speak to another, they might get into a verbal fight leading to a physical fight in which one of them might die. Or if there is some chatting going on in a caveman hunting expedition, it might be a distraction that reduces the chance of success. Or maybe the chatting will alert some lion hiding in the grass to the presence of the hunting party, increasing the chance that some of its members will be devoured by predators. In short, we have the problems that (1) given the very small human population about 100,000 years ago, it would have been extremely unlikely that there would have occurred the mutations necessary for clear spoken language; (2) if a particular individual happened to get such a mutation, it would be very likely that the mutation would be wasted, and would not achieve fixation in the gene pool, because it failed to produce a survival benefit for the individual who got it. So it is very hard to explain the origin of both the first language (a non-physical thing), and also the physical biological improvements that would have made language possible. Possibility 1: Speech may have originated after visiting extraterrestrials established human language (such extraterrestrials may also have endowed humans with modifications supporting speech). Possibility 2: Speech may have originated because of some action of some higher divine power (such a divine power may also have endowed humans with modifications supporting speech). Possibility 3: The origin of spoken language may have been facilitated by reincarnation. The first speaking humans may have been using language they learned in a previous lifetime, which might have occurred either on our planet or in some other dimension or realm of existence. Possibility 4: In the distant past humans may have had telepathy much stronger than anyone experiences today. So even though the first spoken language was garbled speech, people may have been able to clearly understand it because they read the minds of the person trying to speak. Possibility 5: We may be living in some kind of simulated reality, possibly a computer simulation created by extraterrestrials. The simulation may have actually began at some point in which language already existed (such as 3000 B.C. ), so there may have been no real origin of language occurring at some time such as 60,000 years ago. Possibility 6: There may be some kind of life force or driving force of biological organization (perhaps impersonal), something far beyond natural selection, that might be responsible for biological innovations that are poorly explained by natural selection; and such a force may have had a hand in the appearance of language and language-enabling biology in humans. Such possibilities will probably be ignored by the next few professors writing books on the origin of language, who will continue to write accounts that ignore the main difficulties in explaining the origin of language and the origin of language-enabling biology, such as the three paradoxes I have mentioned here.